The following is my interview with Kevin J. Symonds, M.A., author of Refractions of Light: 201 Answers on Apparitions, Visions and the Catholic Church (June 2015), published by En Route Books and Media. Click here to order a copy of the book. MCA: What led to your interest in Catholic private revelations? Could you describe your book and why you think Catholics (and perhaps non-Catholics) would find it of interest? 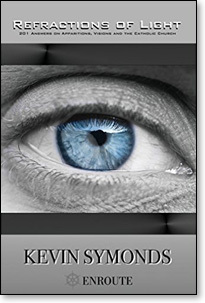 Kevin Symonds: From an early age I seemed to have an eye for all things "mystical" or "preternatural." In the 1980s and 1990s, the culture supporting this interest was not quite what it is today, but there was enough still to garner one's attention if he or she was diligent. My interest in such matters is a cause still for personal reflection, but I can say that it was rooted in the underlying desire of the human heart for the supernatural (God). I was not baptized Catholic and so did not have the truths of Divine Revelation to guide me – and the world can offer terrible alternatives. God, however, would have the last word with me. Briefly, I found God and the Catholic Church after my father fell down a flight of stairs. Some deeply devout Catholics on my father's side shared the Faith with me during his recovery and eventual death. I recall they spoke to me of various claims of private revelations, which, of course, piqued my interest. I remember they spoke to me of the Rosary, the Divine Mercy devotion and Medjugorje, among other things. It was all so captivating to me and I began to turn – convertere – to God. I began to read the Scriptures and other religious literature. God was merciful to me and was showing me the truth and beauty of His Church. The "hook" was my interest in the mystical and God used this to get my attention. After I became Catholic, God continued His loving kindness to me by sending good people into my life who "refined" me further. What I mean is they helped me to see better the depth and breadth of Holy Mother Church, which better situated the place of my interests in my life and work. My book, Refractions of Light, endeavors to present and discuss the theology of the Catholic Church on private revelation as a theological field of study. The book is a product of my own life, work and experience. It is deeply rooted in study, conversations and debates over the course of several years. From these interactions and study, I began to see that there was a need for a book that stated and clarified what the Catholic Church teaches on the subject. In March of 2008, I set myself to this task. I settled upon using a question and answer (Q&A) format as being the most suitable means of communicating the truth and facts of the Church's teaching. The idea was to borrow from the Baltimore Catechism in that Q&A was a very effective means of teaching for the lay faithful. It was not my intention to write a formal catechetical work. The book is designed for the simple as well as the scholarly. The Q&A provides direct information for anyone wanting simple answers, though I do not claim to field every possible question. The Q&A is followed by appendices and endnotes for those wishing to do further research, or, even still, for those who desire to verify the information presented in the book. MCA: Do you think Catholics can be "too attached" to private revelations? Kevin Symonds: The simple answer is unequivocally yes! Though, to be fair, this problem is not simply a "Catholic" phenomenon. There is, in fact, a serious issue within Evangelical Christianity on this matter, especially via the charismatic renewal. For its part, Refractions of Light is intended to provide much needed light on an area where much darkness currently reigns. The title itself conveys this in one sense. The book sheds light and refracts that light so that its beauty in its parts may be better seen, and, hopefully, better understood. This is a pastoral motive. Different people will be able to focus on different things while yet seeing the larger picture. God-willing, something will resonate with readers and lead them on to greater holiness. Three years ago I wrote an article titled "The Greatest of Pastoral Care." It remains today one of my most favorite articles. It was written after a trip to Ireland where I met many good people (I still hold the Irish people dear, let me add). This experience led me to ponder about pastoral guidelines and the care of souls in matters of private revelation – the results of which are readily apparent in the article. In said article I discuss the contemporary situation of the Church, citing the fact of poor catechesis and the lack of access to true and authentic liturgical worship. I affirm in even stronger terms what I wrote then: banal liturgies are a terror and scandal – a plague within Holy Mother Church – and damn more souls to hell with the despair they inculcate within people. This despair all too readily compels them to leave the bonds of charity and unity of the Church for the arms of "another gospel" and thus jeopardizes their salvation. I made sure in Refractions of Light to reinforce the importance of remaining in the Church (questions 76-85), which was upheld even as recently as the Second Vatican Council (Lumen Gentium 26). As I pointed out in my article, this dependency upon private revelation is regrettable, but understandable. The darkness of paganism and the dominion of Satan gains greater foothold in Western civilization and the culture returns to superstition. We see signs of this in the popular ghost-hunter and other "paranormal" programs and literature. Please allow me at this point to make a distinction. I make no judgment upon the people involved in such programs and literature. There are good people – and I know some of them – with an interest in the "paranormal" who simply want to help or are seeking answers to their own experiences. My criticisms primarily concern methodologies and/or motivations that incorporate a larger cultural focus. I have recently discussed the possibility of an interview on my book with some good folks who are demonologists. I hope to touch upon my observations within the discussion so as to provide more clarity on the issue. There are similarities, if not actual connections, between private revelation and the "paranormal" as it is popularly understood today. The phenomenon of "Spiritualism" in the 19th and early 20th centuries provides some historical context for this discussion to take place. I think it is time to open up that discussion and believe my book can be helpful in establishing solid guidelines. To return to the topic of superstition, I would like to make an observation. Within the Catholic, and arguably the "Christian, non-Catholic" worlds, private revelation becomes quite dangerously close to being co-opted by secular superstition. Private revelation gives a semblance of remaining within the bounds of Catholic orthodoxy – it is a legitimate theological field, after all – but the dangers posed today by the greater culture require great caution. This is one way I believe Refractions of Light may be of interest even to non-Catholics. The book stands as a witness to a much larger tradition and offers help to anyone who possesses good will and intellectual honesty and is in need. People are, simply put, being led out of the Church on some level (often subtle) and not deeper into it and the Divine Mysteries she guards and dispenses. I cannot tell you how many times I've heard of, or at least been impressed upon, people choosing private revelation over the Church. All too often, their choice is because they are disillusioned by people or events within the Church. As I indicated in my article, sometimes those who promote or are themselves the originator of a claim of private revelation will take advantage of the sacraments (typically the Holy Eucharist and Confession) in order to achieve their aims. They then appeal to this as "proof" for the claims but there are finer theological edges that are not readily apparent. Clarifying these and other matters is part of the work that I and others are trying to do for the Church, her members and others of good will. MCA: It's been reported that the Holy See will make a decision on the Medjugorje phenomenon relatively soon. Based on what you've studied, what's your opinion of Medjugorje? Kevin Symonds: This is a highly controversial question; one that is very emotional for countless people. Some of its biggest supporters I have met, known, or are acquainted with. I will thus respond in all truth and charity. I do not believe Our Lady has appeared, or does appear, in Medjugorje. I believe the place to be one of Satan's biggest deceits. I say these things as one who went there on pilgrimage and who believed the claims. Further study led me to question then finally to reject said claims. There are some very real questions surrounding the integrity of the "visionaries" of Medjugorje. In formal theology, the credibility of the witnesses is critical and I would go so far as to say that this criterion is very high on the list of things theologians should be looking at. The local bishop has stated that some or all of the visionaries have lied, slandered or stated falsehoods. This is a very serious public accusation for a bishop to make, one that I shudder to think of the consequences if there was no veracity to it. Moreover, it appears as though when "gaffes" have been made by the alleged visionaries, attempts have been made to cover them up. The local bishop publicly called out a very famous priest and exorcist on this very point. I wrote about this a couple of years ago after I personally checked the sources and discovered the bishop's accusation to be accurate. On a smaller note, I am concerned about the devotion Medjugorje engenders within people. Though there are some good people for whom I have much respect, there are other people who have made Medjugorje a sort of litmus/character test or the proverbial shibboleth. Those who promote it and demonstrate a gift for speaking or writing are exalted within what is known as the "Marian-Charismatic Movement." For those who question Medjugorje, there is no room on this "Marian gravy train." I've even heard such persons referred to as the "spawn of Satan!" Characterizing these people as such is not Catholic and indicates a sectarian spirit which is contrary to the Gospel of Jesus Christ. It creates the false dichotomy of one being either "in or out" like some kind of a card-carrying club member with a social ladder and pecking order. This is a poor indication of people living a normal regimen of a life of faith. Faith seeks understanding and it leads to the fullness of maturity in Christ. To be frank, that I have even said these things will either spark a serious reaction or I will be completely ignored. It is no matter. The truth is rarely popular and what I have said needs to be said. In the end, on the question of the Medjugorje phenomenon, like everyone else I await the decision of the Holy See. I trust the Ruini Commission has examined the phenomenon in its entirety – doctrinal, historical, and pastoral – and gave an accurate account of its findings to the Congregation for the Doctrine of the Faith. I learned recently that these findings will be discussed this fall and the Congregation's decision will be submitted to the Holy Father. May it please God to give peace to His Church by a clear, unequivocal and direct pronouncement from the Holy Father. The Church needs such a pronouncement and I believe it to be a justice issue, now 34 years on into the phenomenon.